As numerous people have observed recently, Democracy Is In Crisis. In more and more countries we see democracy no longer working for the common good, but backsliding to authoritarianism. If you want to get the big picture of what Thwink.org is trying to do, these three films are the place to start. It's all here. We don't have all the answers, but we suspect we have some. The rise of authoritarians fits right in the Thwink.org analysis of the sustainability problem. The analysis went so deep it found four main root causes. It also found a feedback loop structure that explains WHY Trump and other authoritarians have been able to get elected and HOW that can be prevented from happening again, IF the root causes are resolved. The first film is shown below. Try to watch it with good speakers or headphones because the music score plays a major part in the production. For the rest of the films see The Democracy in Crisis Film Series. For more information, including another video, see The Politician Truth Ratings Project. We live in a social universe. 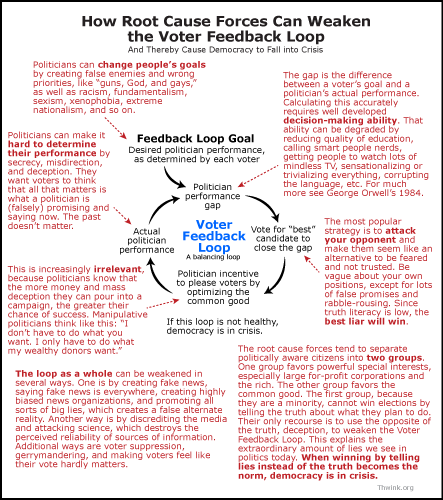 The most important feedback loop in that universe is the Voter Feedback Loop. If it's healthy, then a democratic society works to optimize the common good. But if it's not healthy the loop does just the opposite. It works for the uncommon good, for powerful special interests. 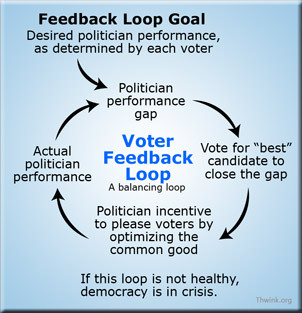 Below is the basic Voter Feedback Loop. The annotated version on the right explains how the loop is easily exploited. The most obvious symptom of recent exploitation is the rise to power of Donald Trump, ironically in the nation that invented modern democracy. Unfortunately, that conclusion applies more than ever to the United States. More. 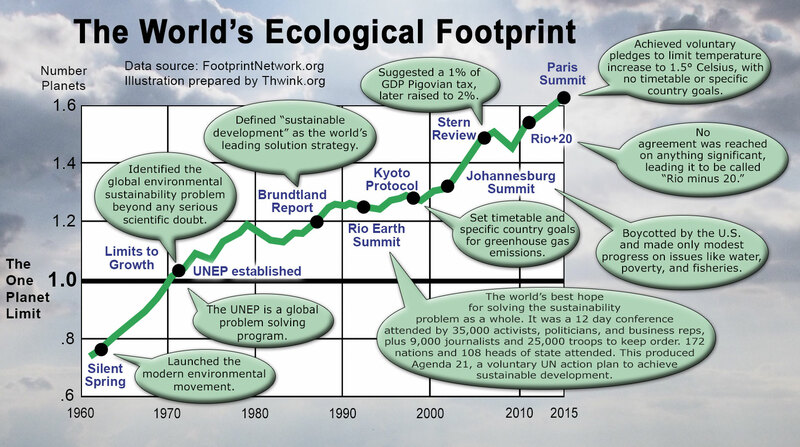 The global environmental sustainability problem has gone unsolved for over 40 years. During that time millions of dedicated activists, scholars, scientists, and politicians have attempted to solve the problem. But despite this massive effort, the problem continues to grow worse with no credible solution in sight. WHY is this? WHY has humanity been unable to solve the problem? Because popular solutions do not resolve root causes. Instead, they attempt to solve what are in fact intermediate causes. Popular solutions are symptomatic solutions. They treat the fever instead of the disease. We know this to be true because all problems arise from their root causes. If a solution fails, it can only be because it did not resolve one or more of the root causes. These four steps are what set the Thwink approach apart from conventional approaches, because they omit the crucial second step of find the root causes. That's like a doctor skipping the diagnosis step and guessing at what a good treatment (solution) would be. Would you go to a doctor like that? If this makes logical sense, then the next step is reading Mastering the Science of Striking at the Root. The graph tells a grim story. So what are the world's problem solvers doing wrong? Why are popular solutions failing to solve the sustainability problem? Because popular solutions are incapable of resolving the root causes. If you are a visual thinker, read this article on A Little Story About Corporate Dominance and the Occupy Movement. If you are an analytical thinker, study this paper on Solving the Sustainability Problem with Root Cause Analysis. If you are a sharp thinker but not that analytical, try this essay on Mastering the Science of Striking at the Root. The Climate Reality Project employs cutting-edge communications and grassroots engagement tools to break the dam of inaction and raise the profile of the climate crisis to its proper state of urgency. With a global movement more than 5 million strong and a grassroots network of Climate Leaders trained by Chairman Al Gore, we stand up to denial, press for solutions, and spread the truth about climate change to empower our leaders to solve the climate crisis. If you've grasped what our material says, you will immediately be able to see that the Climate Reality Project's approach is simply not going to work. It's basically a "spread the truth" approach. This is no different from past approaches, all of which have failed. Why? Because "spread the truth" pushes on a low leverage point. It attempts to resolve an intermediate cause (the universal fallacious paradigm of Growth Is Good) rather than the root cause (high political deception effectiveness) of change resistance. You don't believe this? Then read the Wikipedia entry on Sharon Beder's Global Spin: The Corporate Assault on Environmentalism. Be sure to read the link to the Global Spin Review, which explains how corporate spin works. Spin is deception. It's working like a charm, so well that attempts to "spread the truth" have not worked in the past. Nor will they work in the future. That "the global community still lacks the resolve to implement meaningful solutions" is a symptom of change resistance. Al Gore's project is trying to overcome change resistance. Wouldn't it help if the project promoted solutions that were directed toward resolving the root cause of change resistance? After all, all problems arise from their root causes. If this makes sense, then see the glossary entry on More of the Truth. That's the solution strategy The Climate Reality Project is using. Welcome to a whole new way of thwinking ! Imagine routinely solving whatever portion of the	sustainability problem you're working on. 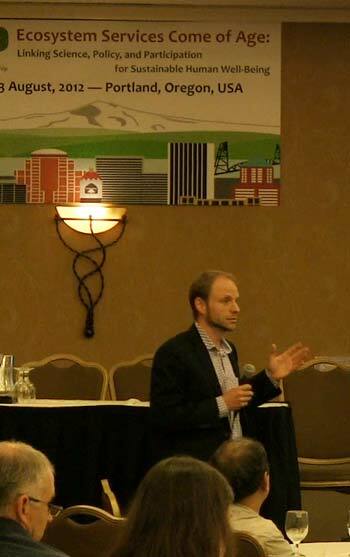 Scott Durlacher presented the paper at the Ecosystem Services Partnership Conference in Portland, Oregon, US, on August 1, 2012. Click on the photo to watch the five minute video of Scott covering the highlights of the paper and its context. How? With the same powerful tool business uses to routinely solve its toughest problems: Root Cause Analysis. Thwink.org has distilled its central message into one paper: Solving the Sustainability Problem with Root Cause Analysis. PDF The paper is jargon free and an easy read since its target audience is all serious environmentalists. The key conclusion is that popular solutions don't work because they do not resolve root causes. Instead, they attempt (in vain) to resolve intermediate causes, like externalized costs or the universal fallacy that Growth Is Good. The analysis found four main root causes. Finding these led to discovery that the environmental sustainability problem is itself a symptom of a deeper problem: the Broken Political System Problem. This is the real problem to solve. Until it's solved the work of environmentalists is largely fruitless. This is a highly controversial and counter-intuitive conclusion, but it's well supported by a mountain of analysis, modeling, references, and examples in the publications at Thwink.org. Using the results of the analysis a solution strategy is presented. Twelve solution elements are required to resolve the four root causes. 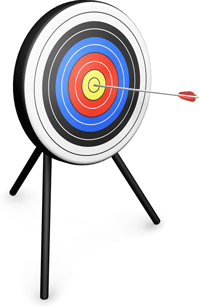 If you know where the bullseye is, your solutions can't miss! 1. Ready - Define the problem. 2. Aim - Analyze the problem with Root Cause Analysis. 3. Fire - Develop and implement solutions that can't miss. Solving the sustainability problem is not a matter of doing the same things better. It's a matter of doing something different. Radically different. What's the real story? What does Thwink.org have to offer?